Happy first day of SPRING! 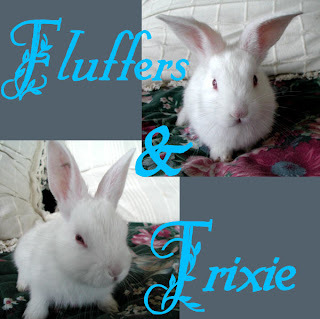 For this momentous occasion I am posting a picture of our old bunnies Fluffers and Trixie (RIP). I know they are dead, but weren't they just sniffy sniff sniffy?!!! How good you made me feel. At the shoe store? Berserk! Ped Egg Rocks! Literally, if it can smooth out my hard-as-rock feet it can do anything! ...I still need a suggestion for my next quest!!! Also curious about your next quest.